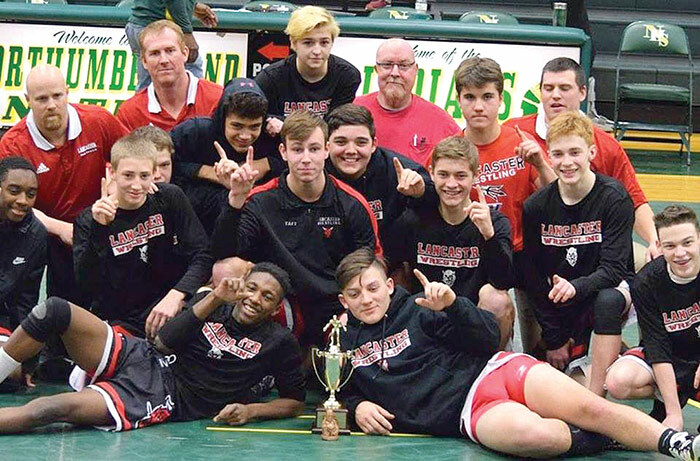 The Lancaster High School wrestling team (above) earned the Northern Neck District championship at the four-team district tournament in Claraville last week. Lancaster produced 10 Northern Neck District wrestling champions and two runners-up to win the district team championship last Wednesday in Claraville. Additionally, Lancaster’s Craig Oren was named the district coach of the year. Lancaster won the four-team tournament with 293.5 points. Northumberland was the runner-up with 140, Washington & Lee finished third with 139 and Essex, fourth with 28. The regional tournament is Friday, February 8, and Saturday, February 9, at Mathews High School. The Red Devils’ Austin O’Bier went 2-1 to win gold in the 106 weight class with NHS’ Trinity Taylor winning silver and W&L’s James Gihuly, bronze. Lancaster’s Destin Henderson beat CJ Timberlake of NHS to win the 113 crown and Marshall Lee defeated Aden Swisher of NHS for gold in the 126 class. Lex Casseday of LHS was crowned champion in the 132 class with a win over NHS’ Kevin O’Malley and Jacob Taft of LHS beat Justin Hendrickson of W&L to win the 152 crown. Brothers Adam and Tate Wilmore both brought home gold for LHS. A. Wilmore defeated W&L’s Reuben Fowler for the 195 crown and T. Wilmore beat W&L’s Hazen Shryock for the 285 championship. Lancaster’s Kyle Uhler (120), Domonique Veney (138) and Zach Rhodes (145) went uncontested for gold medals. Silver medalists for LHS were Jordan Milton (160) and Brendan Walker (170). Northumberland’s Caleb Davis won the 170 title and Bowe Rogers of NHS won the 160 gold medal. Essex High’s Noah Acree beat W&L’s Malcolm Sadler for the 220 championship.